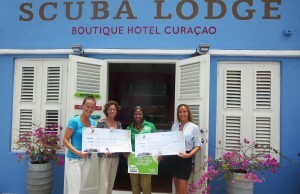 WILLEMSTAD - Today, Scuba Lodge & Ocean Suites has announced it has donated over $2400 to local charities Curaçao Animal Rights Foundation (CARF) and GreenKidz Curaçao. The boutique hotel raised the money during the first quarter of 2017 with their Dollar-a-Night program which was launched on January 1st, 2017. Scuba Lodge's Dollar-A-Night program allows guests to donate a dollar per night during their stay to raise funds for local charities. The funds raised will be donated to Curaçao Animal Rights Foundation (CARF) and GreenKidz Curaçao. Although Scuba Lodge has selected two charities to choose from, each guest will have the final say as to where they would like the donations from their stay to go. "We are extremely proud to say that we have raised $2417 since our Dollar-a-Night program launched at the beginning of this year. We're thankful for all guests who helped make this donation possible, simply by staying in our hotel. Guests respond very positive when we inform them about our program. They are happy knowing that their visit to Curaçao will have a positive impact on our local community," says Christina Sieperda, General Manager of Scuba Lodge. CARF is a non-profit foundation that rescues, rehabilitates and socializes homeless, abused, and/or neglected dogs in Curaçao and finds them loving homes either on the island or abroad. GreenKidz Curaçao aims to create environmental awareness among children on Curaçao by teaching them about protecting nature and recycling.